The four infiltrators were tracked down after a three-day operation and neutralised near Sunderbani town. 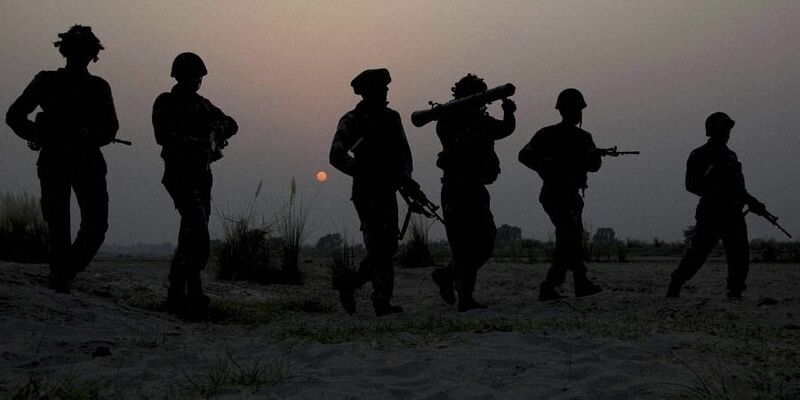 JAMMU: With killings of four heavily armed militants and arrests of several others last year, an alert police force and security agencies managed to keep in check the spread of terrorists' base in the border district of Rajouri, a senior police officer said Sunday. The arrested persons included four over-ground workers (OGWs), who were in close contact with Al-Badr commander Zeenat-ul-Islam, killed Saturday in a gunfight in Kulgam district of south Kashmir along with his four accomplices, said Rajouri's Senior Superintendent of Police Yougal Manhas. Manhas said the police managed to foil a number of militancy-related incidents in close coordination with the Army and other security agencies last year and took stern action against people involved in unlawful activities including drug peddling and bovine smuggling. On counter-insurgency front, security forces last year killed four militants, who had infiltrated from Line of Control (LoC), he said. The militants were killed on the intervening night of March 27 and 28, within days after they infiltrated from Line of Control (LoC), he said. In another significant anti-militant operation, the police and 38 Rashtriya Rifles jawans nabbed two ultras in June 2018, he said, adding the ultras had escaped from the valley after snatching a policeman's weapon. They were overpowered and nabbed even as they tried to open fire at security forces at Thanamandi main chowk, the SSP said. He said besides these, the police and 48 Rashtriya Rifles, in a joint operation, arrested last year four OGWs running a hawala racket in Rajouri and recovered a huge amount of hawala money from them, he added. "These OGWs were in close contact with Al-Badr commander Zeenat Ul Islam and engaged in garnering financial support for the militant outfit in Rajouri but were arrested by forces," he said. The police also detained 11 anti-social elements under Public Safety Act, the SSP said, adding they were engaged in bovine smuggling and drug peddling besides operating as OGWs for various militant outfits. In its drive against drug peddling, 32 FIRs were registered and 52 persons were arrested across the district following recovery of huge amounts of narcotics from them, Manhas said. Besides these, 109 others, involved in different kinds of unlawful activities including drugs peddling and thefts, were taken into preventive custody on executive magistrate's orders, the SSP said. The police also opened history sheets for 46 criminals, involved in drug peddling in the district, with an aim to keep a closer watch on them, the officer said. The police last year also arrested 237 people, involved in bovine smuggling and registered 198 cases against them across the district, he said. On traffic management front, the police fined 12,329 erring drivers and collected a revenue of Rs 16,45,415, besides registering a total of 116 cases of accidents and overloading of vehicles last year, he said. On delivery of public service, the SSP said, the police received 7,648 requests for passport verifications and disposed them all within stipulated period, besides conducting 2,454 service verifications in a time-bound manner last year. The police also verified and issued 811 LoC permits last year, besides issuing 1,507 character certificates to candidates applying for various government and other jobs. The police also managed to apprehend 33 absconders last year, he added. The SSP said the police also held 178 interaction meetings with public across the district in 2018 with an aim to secure peoples cooperation and assure them of police readiness to help them in time of needs.